Lenovo Yoga book review | What Hi-Fi? What do you call a device that is part tablet, part laptop but not quite either? No, this isn’t the start of a really terrible joke - it’s the conundrum we’re faced with when reviewing devices like the Lenovo Yogabook. Thankfully, phablet-esque portmanteaus seem somewhat out of vogue, so instead of a laplet or a tabtop (yes, we shuddered too), the best description seems to be '2-in-1 tablet' or 'laptop hybrid'. Take your pick. Of course, when a product tries to spread itself across two product categories, there’s a danger it’ll turn out to be a jack-of-all-trades but a master of none. Can the Yogabook avoid such a fate? There’s no doubt the Yogabook is a beautifully designed piece of kit. Its magnesium alloy shell is impossibly slim (9.6mm when closed) and seriously light (690g), with a watchband hinge at its centre so it can fold shut like a laptop or over and back on itself like a tablet. 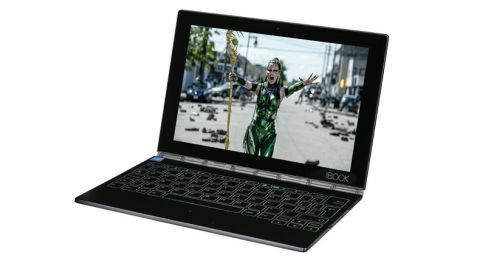 In laptop mode, the bottom section doubles as the Yogabook’s Halo keyboard – an illuminated touch-sensitive QWERTY keyboard complete with touchpad. However, with one click of the pen icon at the bottom corner of the screen the keyboard turns off, transforming the slate into a Wacom digitiser (or “Create Pad”) for drawing and note-taking. You can draw straight on to the surface itself using the Real Pen stylus in the box or attach the included magnetic notepad, fit one of the Real Pen’s included ink cartridge tips, and start writing for real. Your notes will be digitised in real time and saved, wholly searchable by keyword - plus you’ll have a physical copy too. Don’t go thinking you can use any old biro though – the magic lies in Wacom’s built-in electromagnetic resonance (EMR) technology, which not only means the pen never needs charging but also allows it to communicate with the Create Pad’s EMR layer beneath it (even through paper). You get three nibs in the box, which should last you some time, but after that you’ll have to purchase replacements. Whichever nib you use – ink or stylus – the results are accurate. The Lenovo has 2048 levels of sensitivity allowing it to detect and demonstrate any pressure changes, and it also features palm detection so you can lean your hand on it, just as you would a regular notepad, without it interfering. You can even fold the screen over completely so it’s out of the way and, though it switches off to save battery, it’ll still be saving your notes. Very clever indeed. The keyboard is a bit more of a hit-and-miss affair. Getting used to typing on keys with no travel is one thing (though the haptic feedback helps), but it’s just a little too small to be useful for long-form word-processing. It’s actually considered a full-size keyboard, but it doesn’t feel the same as typing on a MacBook Pro (for instance). You hold your hands differently, and tend to type with two fingers rather than several, which doesn’t make for the most comfortable experience. The result is slower typing and more mistakes. After a while, we turned off Lenovo’s own TouchPal keyboard in favour of Google’s option, though you can install other third-party keyboards if you wish. Lenovo’s comes with too many autocorrect quirks for our liking, which are more annoying than they are helpful. Fine for the odd short burst of creativity, and perfect for casual browsing, but don’t expect this to replace your laptop for the ultimate in productivity. The 10.1in screen is a full HD (1920 x 1080) IPS display, which at this price trails some way behind its competitors. The iPad Air 2 offers a resolution of 2048 x 1536, and is cleaner and sharper as a result. There’s also more detail to be had on the iPad. Watching video side-by-side, the iPad gives a better sense of depth and insight to pictures than the Yogabook. Contrast is stronger too, with blacks deeper and highlights brighter and subtler. The colour balance on the Yogabook feels a little off, with colours on the cool side of neutral and lacking some punch. Not only does this make the video-watching experience a little dull by comparison, but its lack of colour accuracy also puts its use as a tablet for graphic designers on a knife-edge. Ultimately though, an uncritical eye will find the picture perfectly watchable, and the screen goes decently bright too. It’s just not the most engaging and insightful to be had at its price. For the most part, the Yogabook performs just fine for day-to-day tasks, but push it too hard and it will start to show the strain. The Intel Atom processor at its heart is quad-core and supported by a decent 4GB RAM, but it’s considerably underpowered for a lot of the work at hand here. Fast typing will often take some time to catch up on screen and, on occasion, it even crashes the Google Docs app we use for word-processing. Multi-tasking will cause some slowdown too. It doesn’t make it unworkable, but it's more than a bit frustrating a device of this ilk hasn’t been equipped with a more powerful chipset to keep things running a little more smoothly at all times. The 64GB on-board storage is generous though, and can also be boosted by microSD card. The battery life from the built-in 8500mAh battery does a good job at keeping you going for a good day’s-worth of use, if not quite as impressive (in our experience) as the 15 hours it claims. Depending on how heavy your usage, you’re likely to get up to 10 hours or so, though lots of video will probably drop this down to closer to 8 or 9. We streamed a video on Netflix for an hour at 50 per cent brightness, and saw the battery percentage drop by 8 per cent. You’ll find the 2.1MP camera that sits above the screen fine for video calls in good light, but don’t expect much from it as far as detail is concerned. The audio performance could be better too. The Yogabook boasts Dolby Atmos credentials, but we prefer the sound with this additional processing turned off. 'Movie' mode, in particular, adds emphasis to the low end, muddying the midrange and impacting on definition across the board. We don’t notice a much improved sense of height with the clips we watch either, so there doesn’t seem to be much reason to have it on. 'Music' mode is less heavy-handed, but we still prefer the original sound. The app is fun to play around with, and there is the ability to set your own custom EQs should you wish, but we prefer to keep it off. When listening to music (it supports audio files up to 24-bit/192kHz), it’s a decent, clear listen, but there’s not as much detail as we hear on the iPad. It’s also not the best with dynamics, leaving a punchier piece of music sounding a little flat, while more complicated songs struggle to stay organised and cohesive. The stereo speakers do a good job though, going loud and giving a decent stereo image for movies. They’re clear too, if a little on the bright side, and don't provide as much weight as a long movie session would really demand. Show it to anyone and expect them to be instantly impressed at its slim profile, portability and attractive light-up keyboard. The keyboard doesn’t make for the best experience though. It’s helpful for short tasks, but long word-processing is frustrating and uncomfortable – if this a wannabe laptop, it won’t come close on the productivity front. We’ll be keen to see how the line evolves in the coming years. But right now, even the wide range of functionality can’t quite rescue its deficiencies in other key areas.